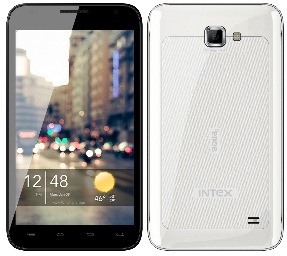 Intex Technologies has launched a dual-SIM Android smartphone ‘Aqua 5.0’ in the Indian market. The device is priced at Rs 9990 and runs on Android 4.0 ICS (ice cream sandwich) version. The device features 5 inch capacitive touch-screen, 1 GHz dual-core processor, 512 MB RAM, 5 Megapixels auto-focus camera with LED flash, 1.3 Megapixels front-facing camera with video calling facility, 3.5mm audio jack, FM radio, 3G, WiFi, Bluetooth 2.0, GPS, 4GB internal memory up to 32GB expandable memory with microSD and 2000 mAh battery. With Ice Cream Sandwich running, users will have access to various Google features such as the Play store for downloading games, applications, books and much more, as well as pre-loaded apps like Gmail, Browser, Flipkart, Facebook, India Rail, Maps, Nimbuzz, Skype and YouTube, amongst others.